Let’s face it, divers need to see sharks underwater, it’s one of the most exciting and exhilarating experiences you can have, along with encountering manta rays and dolphins. 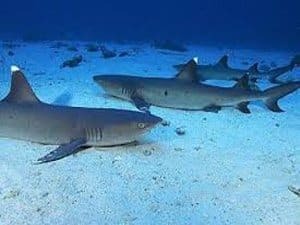 If you still haven’t seen a shark or have seen many, then in all likelihood your first shark will be the ever present whitetip reef shark, or Triaenodon obesus. This sleek reef predator is often the first shark encountered by divers on their sub marine journey. This beautiful shark is sleek and can grow up to 1.6 meters, although most divers will encounter sharks in the 0.8 to 1.3 meters’ range. It has a boxy body cross section with a flattish back and straight sides. The shark has a flat snout unlike other species which tend to have a much more pointed snout. 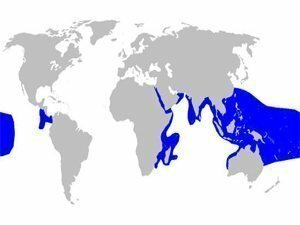 The white tip reef shark is one of the most widespread sharks around the world, inhabiting most of the Indo-pacific and stretching to Africa and up the Red Sea, as well as around Madagascar and even further south to the tip of the Cape. The shark also spreads to the western coast of Mexico, Costa Rica, and even stretches as far as the Galapagos. One of the reasons this shark is the most commonly encountered by divers is that it inhabits coral reefs almost exclusively and spends most of its time between a depth of 8 to 40 meters, which is the perfect depth range for encounters with scuba divers. They are even known to enter water that is shallower than 8 meters deep, and even have been sighted in water less than 1 meter. Fundamentally, whitetip reef sharks are creatures of the night, they are not very fast swimmers and therefore tend to prefer to hunt at night. Like most night owls, whitetip reef sharks prefer to spend their days lounging around under rocky outcroppings, in caves, and under overhanging corals. They are very homely creatures and have a range around 0.05 km2, this is actually very small for a fish of that size since it is only around 10 football fields laid side by side. Once night falls, the enterprising whitetip springs into life, and increases its range by nearly 200 times to 1 km2 in its quest for prey. Unlike other similar sharks which have to keep swimming to force water into their mouths and across their gills, the whitetip has learned a new trick; it is able to sit motionless and use its muscles to actively pump water over its gills and breath without the need to swim around continuously. Whitetips are voracious predators and are pretty much the apex predator on any coral reef. They feed mainly on bony fish, but are also known to have developed a taste for octopus, crabs, and even the odd lobster or moray eel. Their slender flexible body comes into its own when it comes to wriggling and sliding into small holes and crevices to be able to get to its prey. Conversely, when it comes to snatching food suspended in open water they are rather clumsy and mal coordinated. Alas the whitetip does not have it all its way and is preyed upon by some other pelagic species, primarily other big sharks such as the Tiger and Galapagos sharks. 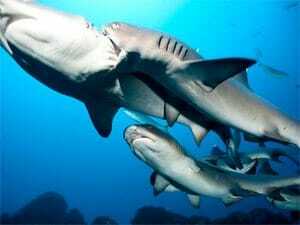 Unfortunately, the main threat to the whitetip reef shark and other sharks is human overfishing and exploitation. Like a lot of sharks, the whitetip is viviparous, giving birth to live young that have grown from eggs held inside the mother’s womb. Once the shark pup has used up all its yolk, the sac is transformed into a connection similar to a placenta by which the mother can pump nutrients to its offspring. After a relatively long gestation period for such a small animal – between 10 and 13 months – usually 2 to 3 pups are born. The shark then starts to develop and grow with juvenile sharks preferring to hide in the shallows. They do not grow as fast as other sharks and generally will reach sexual maturity at about 8 to 9 years old, and a length of 1.1 meters approximately. Interestingly, after some instances in captivity they seem to be able to reproduce asexually with no mating required, which is a truly remarkable feat for a large animal. 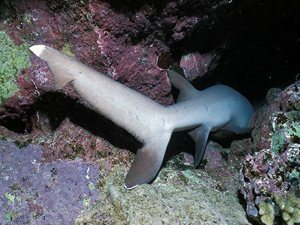 As a diver, should I be concerned about being bitten by a whitetip? Simply put, no. You will not be bitten by a whitetip reef shark, you have more chance of being struck by lightning, or even winning some lottery jackpots. According to the international shark attack file, there have been only five attacks by this species on humans. Of those five, 2 where provoked attacks where the person involved was spear fishing and the shark was after the fisherman’s catch. If you encounter one of these near-endangered species, just enjoy the encounter and behave sensibly. Don’t chase it or block its escape route. What is the best way to spot a whitetip reef shark? I read that whitetip sharks are dangerous and have attacked many people over the years, how come? This is a simple case of mistaken identity with its ocean going namesake, the oceanic whitetip (Carcharhinus longimanus). This is a much larger shark and a completely different species, and it does indeed have a relatively fearsome reputation due to its curious nature. This pelagic species is indeed responsible for multiple attacks but shares nothing with the humble whitetip reef shark except its name. Although people eat shark fins, they are a near-endangered species so you should not really consume whitetip reef shark meat. They are fished in the water around India, Pakistan, and Sri Lanka. 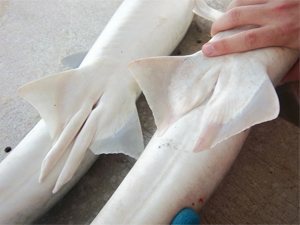 Although the sharks from certain areas are not, due to a unique quirk of whitetip reef sharks: unlike most other sharks, these can be toxic to consume and will result in Ciguatera poisoning. The reason is that they consume many toxic species and end up storing the toxins in their livers and meat. 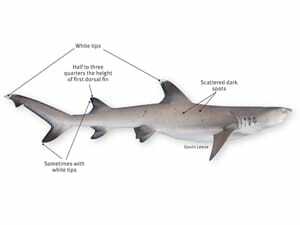 It is definitely best advised to stay well clear of consuming any whitetip shark meat.